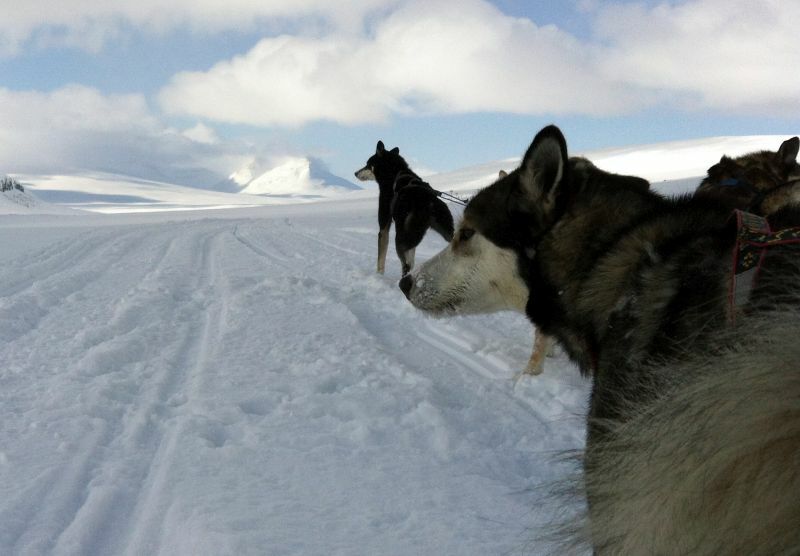 On our 10-day long dogsled tour you travel to areas where the winter lasts seven months a year. The starting point of the tour is our kennel in Kauppinen. We head out through more inhabited areas, still in the lowlands. Gradually, the landscape changes from forest areas to the treeless region, gets more and more remote, before reaching the vast wilderness area in Sweden´s most northern region. This tour takes you to Treriksröset, the point, where the borders of Sweden, Finland and Norway meet. The area we travel on remote trails trough is a tundra and mountain landscape along the Norwegian border, far away from the more frequented routes closer to Kiruna. During 8 days of dog sledding you will get to know your team of dogs pretty well and get a good idea about sled dogs and how it is to work and live with them. 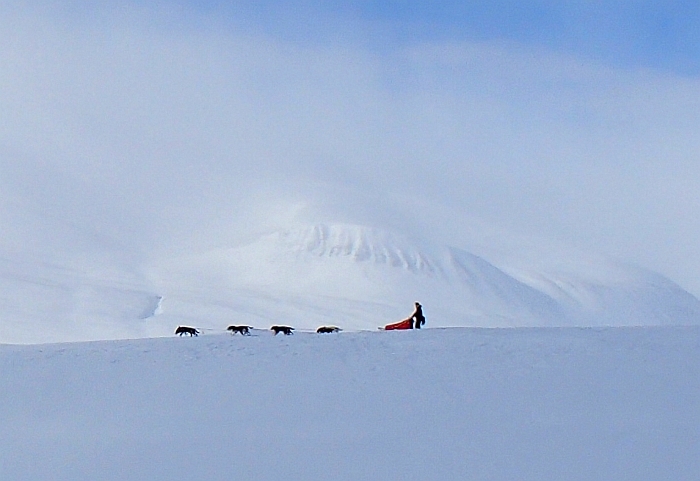 Every participant drives his own team of 5 or 6 Alaskan Huskies. Every day we will work together taking care of the dogs and putting up or breaking the camp. In the mornings the dogs are wild with excitement, ready to go, but turn silent as soon as they start running. Please note that all the food, dog food and necessary equipment needs to be carried in the sleds. 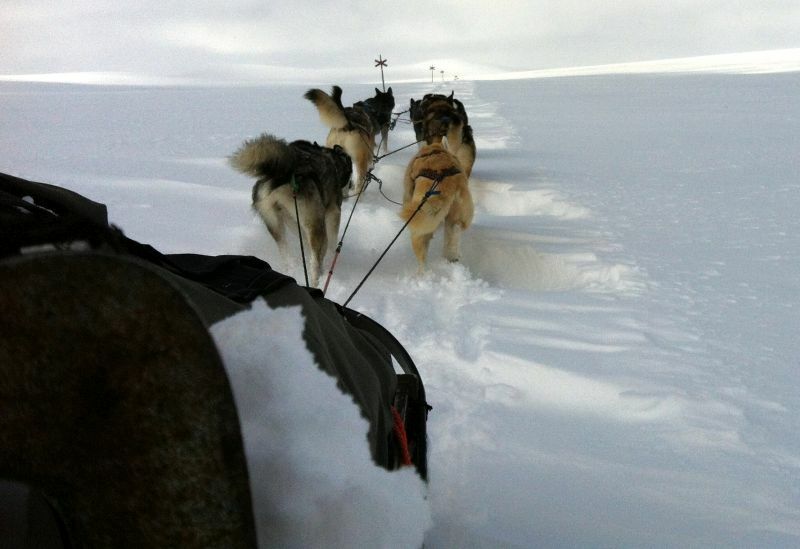 In heavy conditions and on uphill parts the dogs will need your help to move the sled forward. This is all about working together as a team between you and your dogs. The speed we travel at, depends very much on the weather and trail conditions. 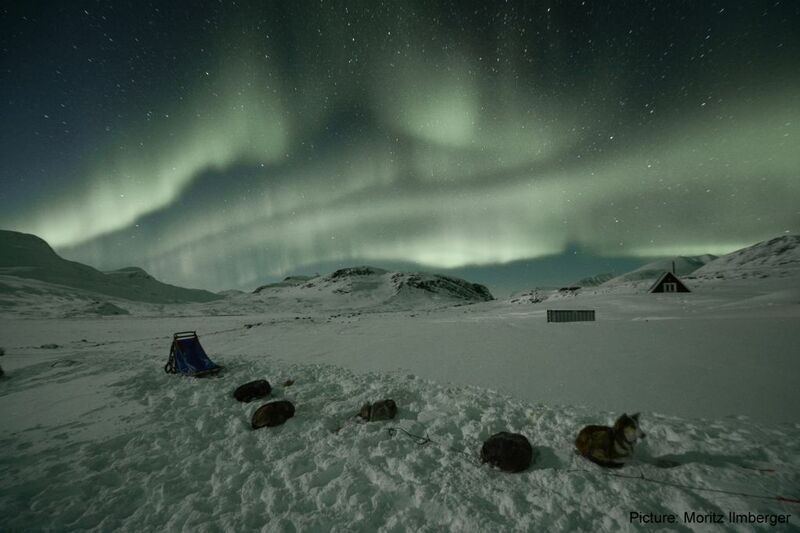 The camps and cabins that are used for the overnights during the dog sledding days, have no running water or electricity. Wood provides the warmth, candles the light and water fetched from a nearby creek or lake. Dinner is cooked on gas or wood stoves, lunch is normally prepared outside along the trail. Most of the cabins have a wood heated sauna, which serves as washing facility or for relaxation in the evenings. Additional facilities are the obligatory outhouse. Please note, that there is no mobile phone reception on this tour, except for the first day of traveling. Day 1: Arrival to Kiruna – Your guide picks you up at the airport and brings you to our home base Mushers Lodge, a 15 km long drive. Here you get equipped with some extra winter clothing (overall, hat, mittens, winter boots) and your guide outlines the tour for you. Dinner and the overnight are at our guesthouse in Kauppinen. 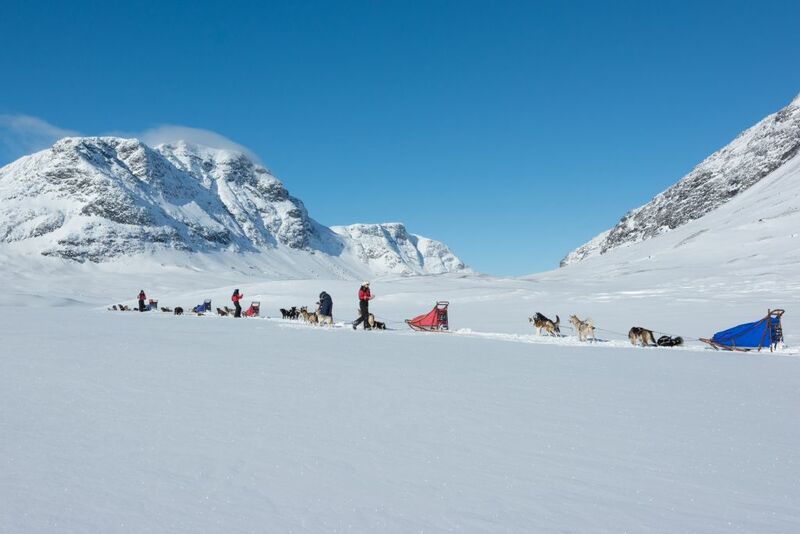 Day 2: In the morning your guide will give you instructions in how to drive and handle your team of dogs. After packing up the sleds, the tour starts. The route on the first day leads north west from Kauppinen to Vieksalahti. This is an about 30 km ride. 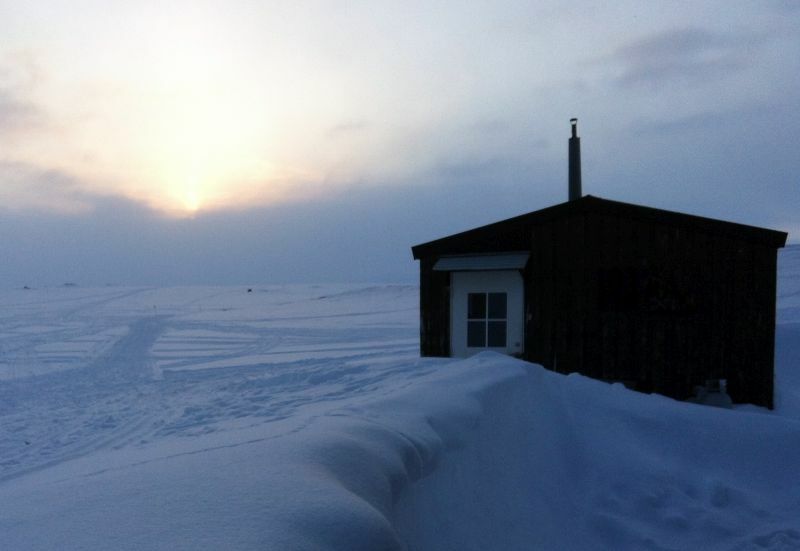 The night we spend in a rustic cabin in Vieksalahti. The relatively short distance on this first day, gives you enough time, to get used to the "camp routines", which will be the same every day. Warm up the cabin, fetch water from creeks or lakes, prepare dogfood, feed the dogs, etc...there is always quite alot to do in the afternoons and evenings. A wood heated sauna is available at this cabin. The trail leads partly through forest and swamp areas, but also to a great extend over the big Torneriver. This makes it a fairly easy first day when it comes to driving skills and gives you the opportunity to get used to the sled. Day 3: From Vieksalaht the route continues north west towards the Norwegian border, to a small accumulation of cabins at the lake called Kamasjaure. The cabins at Kamasjaure are normaly used by the Sami people, when they are gathering their reindeers in the mountain regions and marking the new calves. This day, wWe travel on remote trails, first through a small nature reserve, still in the forest lands. Afterwards, crossing two big lakes and finally climbing up above the timberline. The terrain gets more and more hilly as we get closer to the mountains range along the borderline. The distance is about 64 km and the cabin we spend the night in is a tiny mountain cabin, right beside the lake. Due to the rather long distance and the unpredictable trail conditions, this day can be quite demanding. Day 4: The third day on the trail is a short day, when it comes to distance. It is a 35 km ride from Kamasjaure to Rostojaure. The route is hilly, but not too demanding, although this always depends a lot on the weather and trail conditions. The camp is a fishing camp, with several cabins located along a the huge lake Rostojaure. Partly, the lake is across the Norwegien border, partly it is in Sweden. The screnary is beautiful, as you have an open view on the surrounding mountains. The camp has a wood heated sauna, where it is possible to take a shower in the evening after the last two days. Day 5: Pältsa is Sweden´s most northern range. The Pältsa mountain cabin was used as a base for the resistance movement during WW II. It is located on the Norrkalotten hiking trail, 15 km south of Treriksröset. The distance between Rostojaure and Pältsa mountain cabin is about 47 km. Day 6: From Pältsa it is a beautiful, but not easy day trip up to Treriksröset. It is a quite steep climp for the first 5km, following the Norrkalotten trail and further steep ups and downs until we cross the border to Norway at Treriksröset. Several steep climbs on the way back, of course! We spend another night at the Pältsa mountain cabin. Day 7: On this day we return our steps back to Rostojaure and start the journey home. Overnight at Rastojaure. Day 8: From Rastojaure the route continues south along the Norwegian border. The distance travelled on this day is about 35 km and the night we spend again in a little cabin right beside the lake Kamasjaure. The cabin is again basic, but beautifully located. Day 9 : On this day we leave the tundra areas. After about 20km we reach the forest areas along the Torrneriver valley. We reach the huge lake Torneträsk, close to the Norwegian border, we cross this lake and end the tour at Torneträsk. A beautiful location, to end a great tour, as the last view from the lake up to the mountains is stunning. In Torneträsk we get picked up, load all the dogs and equipment into the car trailors and return back by car to Kauppinen. The drive takes about one hour. The distance travelled on this day is about 40km. The overnight stay is at our guesthouse in Kauppinen. Day 10: Departure, your guide takes you back to Kiruna airport or train station. Our scheduled departures and prices you find under "Dates and Prices" - Additional departures for groups we offer on request.